Pioneer is probably the coolest brand in home cinema. Its sleek, cosmetically finessed designs and cutting-edge performance make the rest of the herd look positively industrial. So how do you go about making a sub-£500 receiver cooler than a penguin's toes? The answer is simple: pack it with features and make it the first affordable machine to hit the market that can be fully controlled from an iPhone or iPod Touch with a dedicated app. While the company's engineers will be keen to point out some of its other finer qualities, such as the seven channels amplification, stereo PQLS jitter elimination and Dolby ProLogic IIz for example, it is the VXS-920's homage to Apple's handheld goodies that really catch the attention. Not only can the device be controlled by an iTunes app, but it also connects any later generation iPod via USB (without an optional dock) and gets closest yet to turning it into a dedicated home server. But that's not all: it also takes a digital audio output from the device to decode within its own DACs for superior performance, and allows searching by cover art on screen, while using the supplied USB + RCA composite video lead. This is all controllable from the Pioneer's own interface, enabling you to hide the iPod away out of sight. On the downside, the iPhone/ iTouch control feature isn't quite as slick as it could be straight from the box. You need to connect the VSX-920 to a wireless router via a hard-wired ethernet cable, and the iPhone/iTouch communicates with the receiver via Wi-Fi to the router and through the network. A direct Bluetooth link up would be far better, and you can purchase the AS-BT100 adaptor for just such a scenario, although at nearly £100 it does add 20 per cent to the cost. On the flip side of that argument, if you wanted to use the Pioneer's extensive vTuner web radio features, including the 24 programmable station presets, chances are you would be connected to your ethernet connection anyway. Slightly annoying for me, is the fact that, although I have run ethernet to the home cinema room, my 120-year-old walls are built with iron-loaded bricks that comprehensively stop the strongest Wi-Fi signal getting through from the office. In that case, iPhone/iTouch control just won't happen without the Bluetooth module or, without temporarily moving the router into the same room at the Pioneer. Needless to say, the machine decodes all the major HD audio formats, has 1080p video scaling of any input, whether analogue or digital and offers v1.4 HDMI connections. 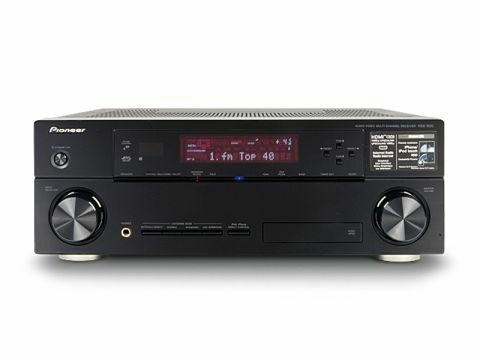 The latter render this receiver 3D-compatible on account of its higher bandwidth and, more significantly, enable audio back haul that lets you amplify, for example, off-air broadcast TV without any extra cables. The latest MCACC room EQ software is fitted as standard and you can now save the data to USB stick for display on a PC rather than having to connect directly. Setting up an AV receiver is just no fun these days; you just connect the mic, press a single button and it's all done and dusted. That's probably a good thing. The supplied remote has a rather lacklustre design, but there is a good selection of fascia controls for when the vagaries that befall handsets happen. However, the iPhone/iTouch app more than makes up for the remote's lack of cosmetic charms in the hand. Once downloaded to my iPhone via iTunes, it connected absolutely automatically through my wireless router. No networking headaches or configuring your DNS protocol, just an immediate connection. Result! The iControlAV App is pure class, too. It offers four screens covering basic control functions, phase and PQLS control, dialogue and bass enhancement and channel balance. The latter sums up the grace and creativity of the software, being a circular tilting table with a rolling ball representing the position of maximum sound. Roll it front left and the emphasis is front left, and so on. Great fun to play with, although I admit probably a bit redundant once you are fully set up. There are also some beautifully animated tutorials on such topics as group phase delays, which will certainly appeal to the enthusiast. With the MCACC and Phase Control engaged, the audio is about as lacklustre as the standard remote control, if I am honest. The sound is rather too smooth and shut-in with mid bass doing a good impression of swamping the mix, despite the MCACC's complex reverb and standing wave calculations. As the ship passes overhead following the opening credits in Serenity (Blu-ray/True HD) the bass is huge and heavy-handed causing me to leap for the iPhone App volume control to back down the horses. Unfortunately, doing so made the ensuing dialogue too quiet so I had to punch it back up. Starting again in Pure Direct mode, with all the fancy EQ systems disengaged, really cleaned up the sound, particularly the mid bass. Exactly the opposite result to what you would expect. Re-running the opening sequence of Serenity, the echoing, metal-walled facility where river is kept, is neatly portrayed with a good sense of both space and containment. After the escape, The Operative's voice is wonderfully cool and foreboding, with the sword effects cutting through the quiet scene with precision. But the VSX-920 still struggles when the going gets tough, being rather too laid back to excite at low levels, and not having the power or drive to deliver the goods at high volumes. The classical music track, which accompanies Serenity as it flies through space, is clean and etched into the soundstage, only for the roar of the engines and the ensuing chaos of the nearby crash-landing to turn into a congested mishmash of effects. I really could not find a volume at which the VSX-920 was truly happy, and neither did it conjur any magic to really impress me with action flicks. With less demanding material, namely a night in with Shrek, plus both its sequels back-to-back, with a bottle of Sandhurst vineyard's finest, the Pioneer is much more at ease. It conveys Myers' comedic Scots accent with all its quirks, and the feel-good score throughout the original Shrek has a good foot-tapping quality. Voices are accurate, if a little trapped inside the centre channel speaker, and there is no shortage of rather heavy-handed LFE. The soundstage is still not exactly massive, and open sky forest scenes have nothing like the sparkle and natural ambience the best sub-£500 receivers can offer. The VSX-920 is not going to win any head-to-head performance shootout at £500, but you can't fault its appeal as the hub of your home entertainment. The iPod integration is great fun, and once the album artwork has loaded (this took several minutes for my stuffed 80Gb model), it stays put as long as the machine is connected. The searching for a song by cover art is a neat touch, and I could easily see users leaving their old iPods connected to the receiver as a fixed server when they upgrade to a new Apple iteration. Again, sound from both the iPod and net radio fell foul of the Pioneer's rather thick balance, making me check that my iPod's own EQ wasn't set to 'bass enhancer', as there was so much mid-bass bloom. You have got to look at the VSX-920 as more of a lifestyle product for those who prefer gadgets and convenience above extracting the last few n'ths of sound quality. The network and iPhone/Touch/Pod features are wonderful toys, but when you are sitting down to enjoy a movie, they don't count for much.